Warmer weather and a weaker pound helped boost retail sales in July, according to official data. Retail sales grew by 5.9% compared with July 2015, the Office for National Statistics said. "Better weather this year could be a major factor, with sales of clothing and footwear doing particularly well," said Joe Grice of the ONS. He added that there was anecdotal evidence suggesting the weaker pound encouraged overseas visitors to spend. Sales of watches and jewellery were up 16.6% in July compared with the same month last year - the biggest jump in nearly two years. 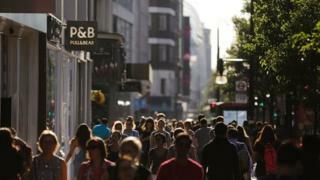 Compared with June, UK retail sales were up 1.4%, a figure that was much stronger than expected. Sterling climbed almost a cent against the dollar after publication of the figures. The retail data went against expectations of an immediate hit to consumer confidence from the UK's vote to leave the European Union. Other figures released earlier this week also showed little immediate impact of the Brexit vote on the labour market, but there were signs of inflation pressures building after the plunge in sterling, which could diminish the spending power of households. Dennis de Jong of UFX.com said: "The High Street certainly hasn't taken as big a hit as many had predicted in the immediate aftermath of Brexit, but retailers will still have concerns about what lies ahead over the next few months. "The government won't be celebrating just yet, as they will need to see more evidence that consumers are continuing to reach for their wallets as the effects of Brexit become clearer." Samuel Tombs, chief UK economist for Pantheon Macroeconomics said that "consumers' blissful ignorance won't last long". "July's retail sales figures show that consumers have been protected from the immediate fallout of the Brexit vote, but with firms intending to stop hiring and inflation set to soar, the High Street is set for a tough year," he said. "The real test for consumer spending lies in 2017 when jobs cuts will kick in and inflation will erode spending power," Mr Tombs added. The Bank of England more than halved its forecasts for household spending growth over the next two years after the vote to leave the EU. It now expects growth in spending of 1.0% and 0.75% in 2017 and 2018 respectively due to lower growth in wages and higher inflation.